Since it's my last month in Calgary, I thought I'd share a few more places that I've been frequenting as a follow up to my Breakfast/Lunch/Dinner in Calgary post. You know... in case any of you ever happen to be in town (the likelihood of which, I realize, is probably quite slim). But I like food posts, so here we go! 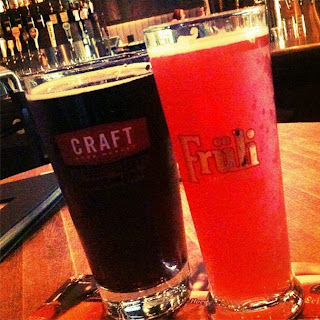 I'm not a huge fan of beer but Craft apparently has the largest selection of draft beer in Canada so I was actually able to find one that I like (in case you were wondering, it's Fruli, which tastes exactly like strawberries). They also offer a wide variety of food, including some amazing nachos which come served in the sawed-off bottom of a keg. And some good news for Vancouverites: Craft is set to open up in the False Creek/Olympic Village area soon. I know it's been met with some controversy from area residents but the city could really use a bar like this - if not there then somewhere else. Who doesn't like cream puffs? Especially ones that you can customize! At Cruffs, you choose the shells and they will fill up your cream puffs with whatever filling you want, from the typical Chantilly cream to mango or Baileys (plus more). As a coconut lover, I especially love the coconut shell filled with coconut cream. Yum! Clive Burger is a hip burger joint on 17th Avenue with some great minimalist decor and a cool ambiance. Using locally sourced products, they make simple but delicious burgers with your choice of fixings. I'm told their fries are to-die-for as well, but unfortunately can't eat them since they're cooked in peanut oil and I'm deathly allergic. So sad! Instead of classic milkshakes, Clive is also known for their custard shakes which come in 4 flavours: chocolate, vanilla, coffee, and cherry. They are as decadent as they sound and so so good. You may remember that I went on a bit of a gourmet doughnut bender last summer, so I was excited to find Jelly Modern Doughnuts here in Calgary. They are considered Canada's original gourmet doughnut bakery, and I've even seen them on the Food Network before. Unlike the heavier/cakey doughnuts that I'm used to, Jelly Modern's classic doughnuts are light and fluffy with a range of different fillings. I've tried quite a few now and I'd say my favourites are the Coconut and the Carrot Cake (which you saw in this post). Jelly Modern also makes sandwiches out of their doughnuts, which you can buy if you're looking for something more savoury. Alberta is known for its beef and I was determined to find some good steak somewhere in the city. Well, I'd say CHARCUT has it. In fact, I think CHARCUT may actually be my favourite steak restaurant. Ever. This place is on the more expensive side since the menu is à la Carte but it is so worth it. The Spring Creek Butcher Steak I had was cooked to perfection and the Smashed Poplar Bluff potatoes with sour cream, rosemary, and house-smoked bacon were divine. And don't even get me started on the dessert... cheesecake in a jar. I am drooling just thinking about it. I could seriously eat at least 2 of these (or more but then I'd probably be accused of gluttony). If you are ever in Calgary and you like steak, you have to go here! Clive burger sounds really interesting. Definitely some great recommendations here. This all looks so delicious! Probably not the best post to be reading right around dinner time. Now all I want is cream puffs and beer! 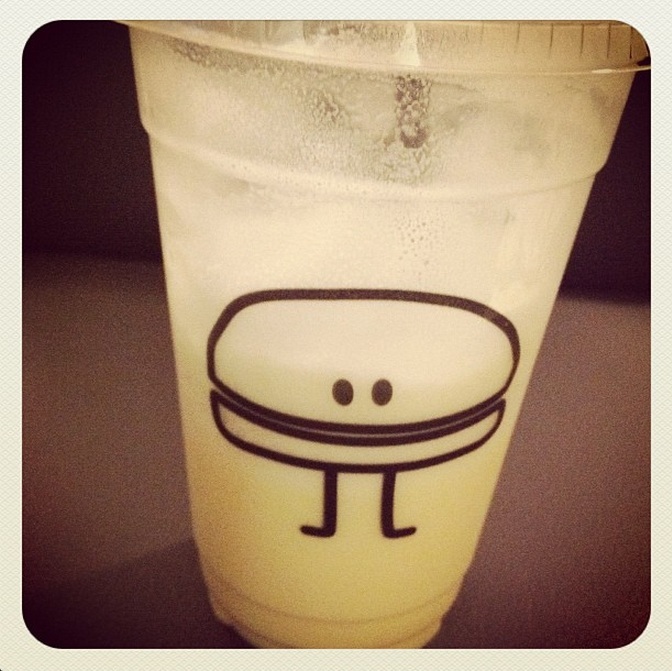 I need to try Clive burger! i love cruffs and jelly modern doughnuts!!!! :D sinful desserts i get to take back here in the prairies every time i visit calgary!! :D yum!! :D must try the others you suggested! OHHHHHHH i love this! thanks for doing this.. always looking for eating recommendations especially when i'm traveling! that cruffs place is AMAZING! looks so yum and i love love that you can customize the filling omgosh yums! So many yummy sounding places! Hopefully I'll be able to visit Calgary one day to visit some of them! Food posts always make me hungry! Yum! Cream puffs look so good. That dough-nut looks so good !!!! Oh man...I don't eat cream puffs and I don't like beer. But reading your descriptions of each made me want to start eating/drinking. lol. Seriously...a beer that tastes like strawberries? That sounds dangerous ;) And I'm a huuuuge coconut fan. Coconut cream puffs sound amazing! Lol this is kiiiiilling me. So close to being done my Whole30 (no dairy, no gluten, no fun) and am dying to eat all of this! It all looks beyond amazing!